The Ragdoll cat is a big and surprisingly heavy cat. Its medium-long coat has a soft texture and does not mat as readily as other breeds. 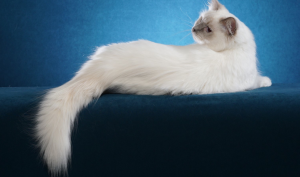 Ragdolls are essentially pointed cats, born white and slowly developing color and pattern over two years. Although well-muscled and with a weight advantage over most other cats, this breed has a gentle disposition. The Ragdoll is open to training with rewards and can easily be introduced to use a scratching post. We raise Ragdoll cats at our Colorado cattery in a healthy and stimulating environment. We can ship anywhere in the US and internationally. Please feel free to contact us with whatever questions you may have when considering a Ragdoll cat.